If you have ever experienced having a rodent in your home, you know what a frustrating occurrence this can be. You can do everything possible to catch the pest and get nowhere. You can set traps or seal off your home, but mice and rats can still avoid being captured. When this happens, it is clearly easy to get discouraged and simply give up on the whole process. We would encourage to have a bit more perseverance, however, and check out the suggestions below for keeping rodents out of your home. Your weatherstripping is the long, rubber material that works as a threshold between windows and doors and their frames. The point of this material is to create an airtight seal between the interior of your home and the outdoors. Regardless of how great the quality is, weatherstripping will wear down over time. When it becomes damaged, the outdoor air is no longer able to be kept out. Additionally, these small holes are the perfect entry point for mice and rats to enter your home. Rodents can easily feel the heat that is being emitted from your home through these small openings and will sneak beneath the weatherstripping and into your space. If you notice that your weatherstripping is wearing down, you can easily buy new material at your local hardware store. Believe it or not, it only takes an opening the size of a dime for a mouse to squeeze through and make their way into your home. Some of the most common places rodents will find small holes this size is around your utility lines. Whether it be your gas, water, or electrical pipes and vents, these all allow a path from the exterior of your home to the interior. Rodents will often follow the smell of water or gas along the pipe until they find an opening and from there they have an easy access point. In order to determine if you do have openings around your utility lines, you should walk the perimeter of your home and inspect them carefully. If you find an opening, you can use caulk or steel wool to close it up in no time. Remember, even the tiniest hole can be an access point. Before rodents ever become attracted to your home, they have to find something enticing about your yard. This can be for any number of reasons such as enticing food, moisture, or shelter. This is why it is important that you keep your lawn in good shape all year round. Your lawn should be mowed short and you should take care of any weeds that you notice growing. You might also want to consider cutting back on how much you water your grass during the hotter months, as an excess of moisture is sure to attract rodents. The strength of noses on mice and rats is actually quite incredible. Not only can they smell much better than humans can, but they also can deduce certain information from smells. For instance, they can tell where food is located, how much there is, and how easily they will be able to acquire it. All that information just by sniffing the air. Incredible, right? Keeping this in mind, not letting your trash in your home pile up is extremely important. Garbage is the most enticing smell in the world to a mouse or a rat. Don’t give rodents any reason to come investigate your home! Be sure that you are taking out your trash as soon as it is full. 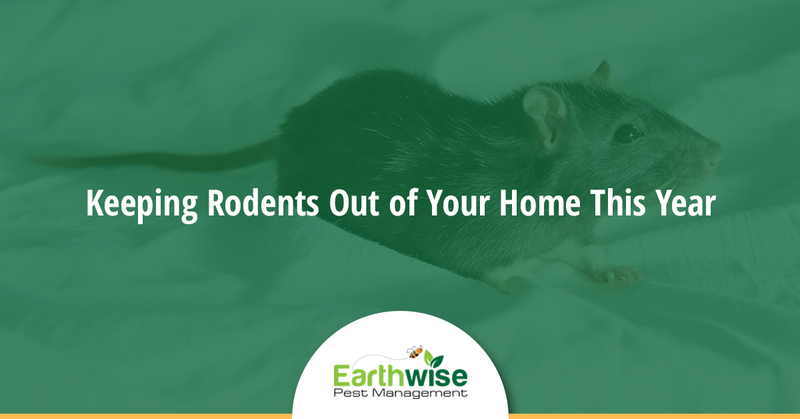 Having rodents in your home is not something you want to deal with for an extended amount of time. If you want to make sure you have taken care of the problem, be sure to call Earthwise Pest Management today. We would be happy to take care of this problem for you so that you can feel comfortable in your house at all times. We also offer free quotes, so it’s time you take advantage of one! Call right now and make your home healthier and safer all at once.